When was the last time you had “on the job training” or started a new job and had to sit through hours of orientation? When we start a new job or need to go through on the job training, we typically have someone walking us through new corporate policies, new programs or a new way to sell the products. This is a form of Discipleship. We are all in need of on the job training at times and we are all in need of someone walking us through a way of life that points us to Jesus. 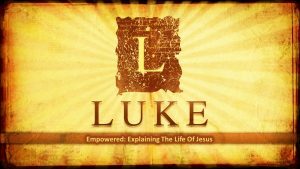 This week we continue to look at the life of Jesus and how Luke is explaining to Theophilus the way of Jesus. Remember, Theophilus has been discipled and walked through this information at one point and Luke is writing down all that he has been taught. See Luke 1:1-4 for more information on this discipleship model. Last week we covered the first 6 Key Discipleship Truths from Luke and this week we will add 2 more. When Jesus called Levi to come and follow him Levi had a decision to make. Read Luke 5:27-29 – What compelling persuasive argument did Jesus give Levi? When Levi got up and left everything, what was his first act as a follower of Jesus? Why do you think Jesus was Ok with attending this party? Think back to Luke 4:18-19 which is Jesus’ Purpose Statements. How do you think this changed Levi’s life? What was changed in your life when you began to Follow After Jesus? – Could people tell a difference in your life? Could they still tell a difference? Explain. Why do you think the Pharisees were frustrated with the way that Jesus handled these situations? How was Jesus’ way Radical? How is this form of Discipleship a New Wine Skin? Walk through the ideas of why it is not smart to put new wine in an old wine skin. Or if you need to look at it from a different way, think about putting a new patch on an old pair of jeans. Have you ever been told, “you could fix this car, lawnmower, … but it would not be worth it …” Sometimes it is best to just get something new! How is this Discipleship New? Read 2 Corinthians 5:17 – How are you made new? What is new in your life? I pray that as you have these discussions you are continuing to learn how you can explain the life of Jesus. How could you explain the life of Jesus by the way that he responds to Levi and to these Pharisees? If you are looking to get plugged into a community we call Life Groups, we would love to have a conversation with you regarding the importance of community. Please visit http://lighthousechurch.net/groups for more information.